إذا كنت تبحث عن عقار بموقع جيد في المدينة، فقد وجدت ضالتك في فندق نوفوتيل بريسبان. يسهل الوصول إلى هذا الفندق ذو 4.5 نجوم من المطار، فهو يبعد عنه مسافة 16. Km فقط. يضفي محيط الفندق اللطيف وقربه من أكثر المعالم السياحية جذبًا سحرًا خاصًا على هذا الفندق. إن الخدمات الممتازة وحسن الضيافة العالي في فندق نوفوتيل بريسبان تجعل إقامتك تجربة لا تنسى. يمكن الاستمتاع بمجموعة من الخدمات على أعلى المستويات في الفندق كمثل خدمة الغرف على مدار الساعة, مكتب الاستقبال على مدار الساعة, مرافق مخصصة لذوي الاحتياجات الخاصة, تخزين الأمتعة, واي فاي في المناطق العامة. لقد جهزت هذه الإقامة الفندقية بعناية فائقة لتوفر مستوى عالي من الراحة. في بعض الغرف يجد النزيل تلفزيون بشاشة مسطحة, غرفة معيشة منفصلة, اتصال لاسلكي بالإنترنت, غرف لغير المدخنين, مكيف هواء. سواء كنت من محبي الرياضة أو كنت تتطلع لتفريغ عناء نهار صعب، ستجد خدمات ذات مستوى عالي بانتظارك كمثل مركز للياقة البدنية, ساونا, حمام سباحة خارجي, تدليك, ملعب للأطفال. يحظى فندق فندق نوفوتيل بريسبان بموقع ممتاز وخدمات يصعب منافستها. This hotel is in a great location and has very good facilities, however, it is expensive and having to pay a daily rate for the internet (very average speed) is a definite negative. Overall I would say a good, comfortable hotel but for the prices they charge I expected more. Walking distance to train central station. Walk 10 mins to Queen Street. Opposite side road near church got bus station. If take airtrain reach central station, walk toward hotel road path still can manage. But, take note there is uphill slope road path to hotel lobby. If carry heavy luggage, more careful. I stay at 6th floor, the WiFi is too weak to connect. Free WiFi lobby is ok. Take taxi to Brisbane airport approx 35+dollar. I would consider staying at the hotel again provided parking is FOC. 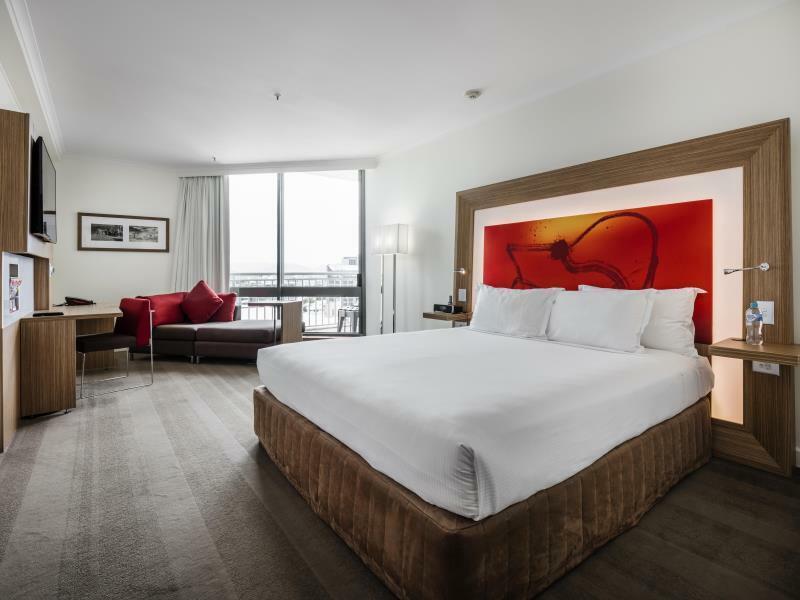 I had to dish out AUD 50 for a 2 night stay which in my opinion is a bit ridiculous. There was ample parking space at the basement and the least the management could do is to absorb such costs or spread it in the package offered to potential customers. Other than that, it was a pretty pleasant stay. 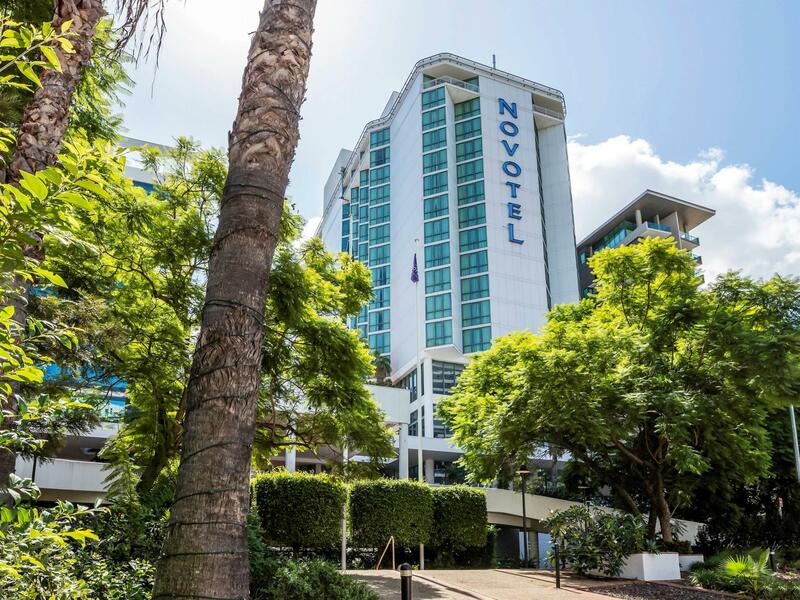 The Novotel is in a great location if you wish to locate yourselves in the centre of Brisbane. It is close to Queen Street and the Eagle Street Wharf area which houses lots of great bars, casual eateries and fine dining restaurants. We were there for the Big Bash cricket. Brisbane City Council offers free transport to the Gabba from Anne St which is just a block away. The staff, rooms and related amenities were fine. If you have a car it will cost you nearly $40 a night to park your car underneath. AND the hotel charges $10 to $20 a night for wifi!! This is 2018! A little hard to find (Uber driver couldn't find it) but centrally located in the city and a stone's throw from Central station. 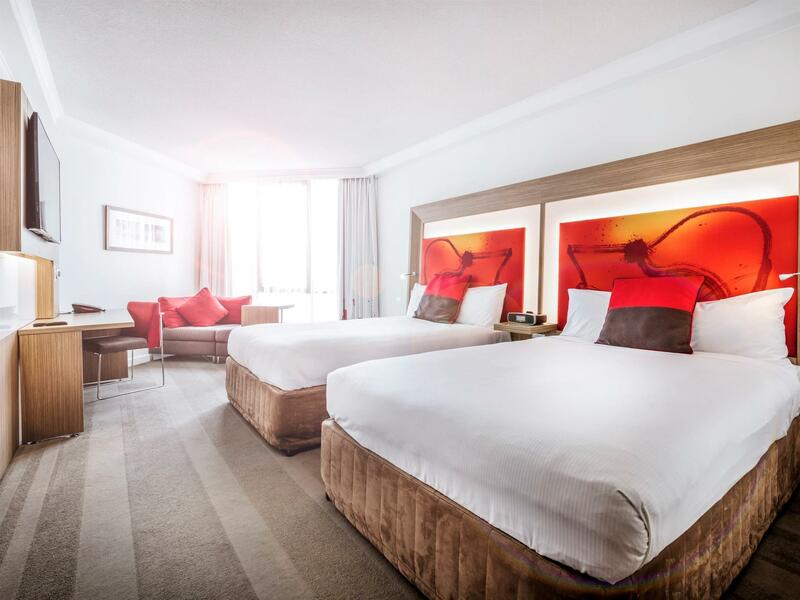 Staff were very friendly and helpful; Room was clean and well presented; What else do you need? We were there for a concert at Suncorp Stadium it was an easy walk to central station to get the train. Breakfast which was included was great. Only negative was the wait to check in, at 2pm (check in time ), more than one staff member is needed! Had a short one night stay at the hotel due to a conference being held at Novotel. On arrival the staff were extremely friendly and welcoming. The room had 2 queen sized beds, a flat screen tv and a fully stocked mini bar. Everything I could ask for. I used the gym which had all the weights and equipement needed. I didn't use the sauna or pool but will do the next time. Breakfast was delivered to my room with no delays and was delicious! Check out staff was very friendly too and stored my bag until after the conference. When I was leaving the hotel another staff member walked me outside to show me exactly where the train station was. I will defintely stay at this hotel again and recommed to friends. 1. Rooms clean & comfortable 2. Breakfast - had gluten free & almond milk available. 3. Healthy options available with room service. I enjoyed my stay. The staff were helpful, & I was able to walk to Eagle St for dining & Queen St for shopping. Rooms were clean, comfortable & spacious. Really appreciated the availability of almond milk for breakfast. 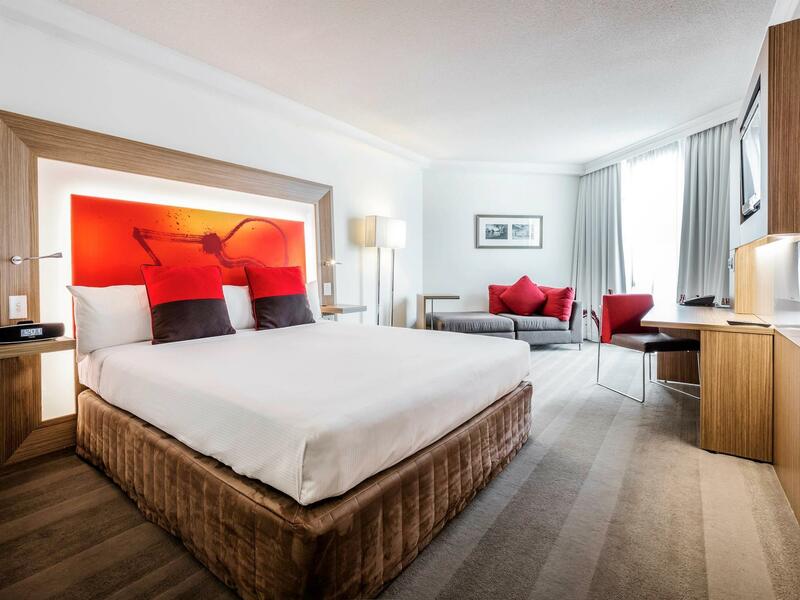 From the moment I arrived the warm friendly welcome I had from the staff at the front desk made a big difference to this tired business traveller. 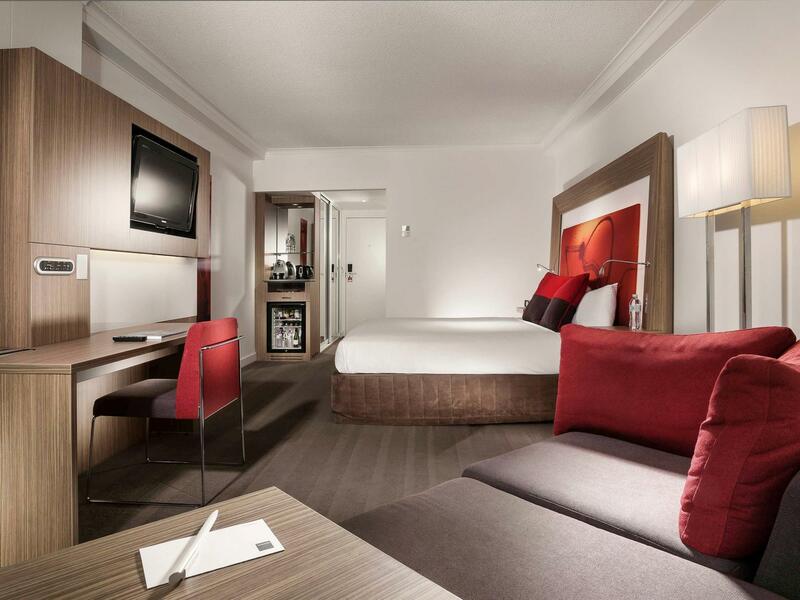 The room was clean and comfortable and the hotels location was perfect for me to reach my clients for meetings. I would definitely stay here again. Great value for money, perfect location for our function & beautiful buffet breakfast! We were a family of 4 in Brisbane for Riverfire. The hotel was fantastic, great location to eagle st pier, breakfast was really nice and great value for money. We booked an early bird special rate 3 months prior. Only complaint was our room was not ready for check in at 3pm & were originally refused complimentary drink vouchers whilst we waited for our inconvenience! We were however offered these by a 2nd staff member. We will be back!! service , cleanliness and location . I can recommend this hotel . The service was both friendly and professional . I also enjoyed the breakfast , although there seemed to be less choice compared to my previous visit , which had a great selection of fresh fruit . They also said the outdoor pool was heated . This was not the case unfortunately . Overall , I enjoyed my stay . The hotel is quite near to the Central station, however, you have to walk uphill, so with heavy luggages, it's definitely not an easy task. I bought 9 mini cupcakes in a plastic box from the supermarket and left on the working desk, the next morning to my surprise I noted 40 to 50 tiny creatures like ants inside the box! Also found them in the washroom and on the working desk. Informed the cleaning lady but no improvement on the days after. So end up we have to live with the tiny creatures for four nights! Some bath towels are not clean, with black stains and dust. End up we have to share the use of the towels. Good overnight stay. A little misunderstanding with the car parking but the staff sorted it out quickly when I checked out.